Ahead of the Miles Franklin Award this Thursday comes this thoughtful piece from The Weekend Australian. 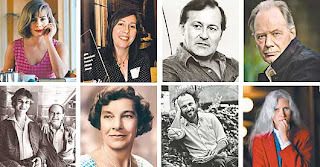 Pic shows a number of previous Miles Franklin Award winners. Gavin McLean tells me you are able to open the Reed Publishing exhibition at the National Library Gallery on 9 August. Can you please get in touch with me so that we can confirm arrangements etc in a non-public way? I believe you are out of New Zealand at the moment?